Manufacturer of a wide range of products which include diamond od grinding ring, diamond knotch cutter / wear indication tool and diamond knotch cutter. This type of face diamond coating rings normally used in BRAKE SHOE manufacturing companys. Wheel size and grits depending upon the customized. We are offering Diamond Notch Cutter to our client. Knotch cutters /wear indication cutters of different sizes and shapes can also be supplied as per customer’s requirements. Sizes of 16mm, 20 mm, 30 mm and 38 mm dia Knotch cutters/wear indication cutters are commonly used. 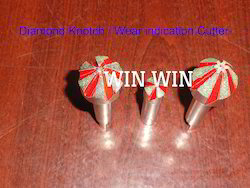 We are offering Diamond knotch Cutter to our client and our product is made of good quality.